The sizes shown range from 9 cm to 36 cm in diameter, measured across the rim. These Temple Bowls or Rin Gongs are traditionally used by Japanese Buddhists either on the home shrine or in a temple. The bell would be placed on the shrine on it's cushion and struck once at the start and end of meditation, producing a very clear ringing tone, then the stick would be placed next to the bowl, never placed in it. (similarly chopsticks should never be placed in an eating bowl).In the temple the bell could be struck several times during chanting. 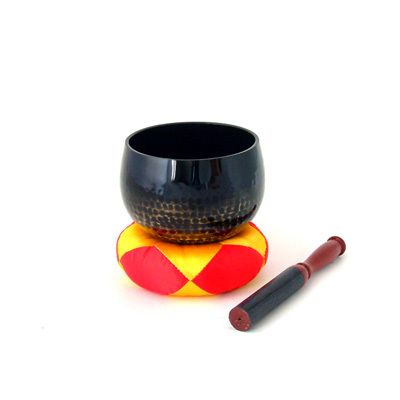 Each bowl comes complete with satin cushion and mallet. The sizes shown range from 9 cm to 36 cm in diameter, measured across the rim. Larger sizes are available to order.